South Korean President Moon Jae-in and Italian President Sergio Mattarella met in Rome on Wednesday to discuss bilateral ties and ways to expand cooperation on regional and global issues. The meeting took place a day after the Korean president arrived in the Italian capital for an official visit. Moon was set to hold a summit with Italian Prime Minister Giuseppe Conte later in the day. “In the meeting with President Mattarella, the two presidents discussed a wide range of issues, including the countries’ diplomatic and defense cooperation, ways to boost their future-oriented cooperation, conditions on the Korean Peninsula and their global cooperation,” said Moon’s presidential office, Cheong Wa Dae. “President Moon thoroughly explained our government’s efforts to denuclearize the Korean Peninsula and establish peace, and President Mattarella highly evaluated President Moon’s leadership in establishing peace on the Korean Peninsula,” Cheong Wa Dae also said in a press release. Moon was set to attend a Mass at St. Peter’s Basilica in Vatican City later in the day, called the “Mass for Peace” and devoted to peace on the Korean Peninsula. The Mass, held in Moon’s honor, will be celebrated by Cardinal Pietro Parolin, the Vatican’s secretary of state. Both Moon and first lady Kim Jung-sook are Roman Catholics. On Thursday, Moon will meet with Pope Francis and is expected to deliver a personal invitation from North Korean leader Kim Jong-un for the pontiff to visit Pyongyang. In a special contribution to the papal newsletter, Moon wrote that he expects more active exchanges between the Vatican and North Korea and that true reconciliation, cooperation and lasting peace between South and North Korea will require more than just political and institutional changes, according to Cheong Wa Dae. 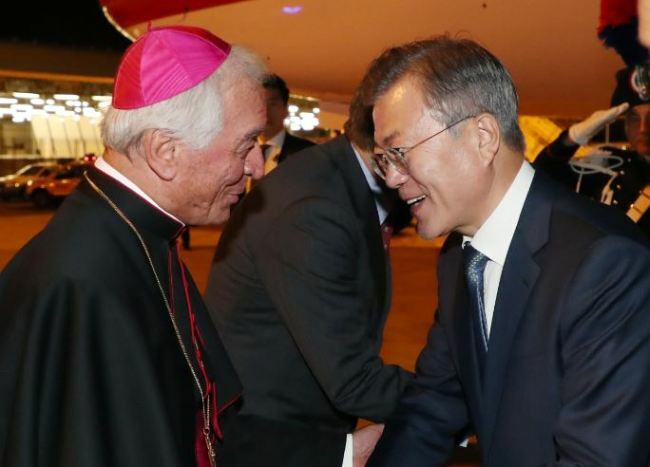 Moon will end his three-day trip to Rome and the Holy See on Thursday to head for Brussels, where he will attend the biennial Asia-Europe Meeting. His five-nation European tour will end in Copenhagen, where he will take part in the inaugural summit of Partnering for Green Growth and the Global Goals 2030, also known as P4G. Moon is expected to seek the blessing of the Holy See for those efforts when he makes his official visit to the Vatican on Wednesday.